If you live in a rural area, dealing with wildlife causing havoc on your property is probably one of your top concerns. Maybe you have a raccoon, opossum, or squirrel problem – but more likely, the pesky critters you’re having a problem with are deer. Deer are known to be great jumpers who can plow through or hop over even fairly high and sturdy fences. So what can you do to keep them out? 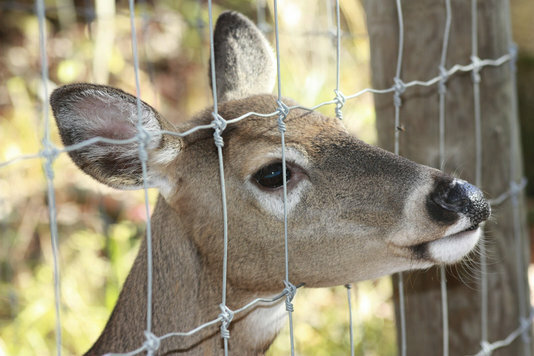 Deer fencing can be effective if built correctly and with a few important details in mind. Deer fencing can be effective if built correctly and with a few important details in mind. A frightened deer can typically jump as high as 6 or 7 feet! In order to totally keep deer from jumping over your fence, construct a solid, 8-foot fence that the deer cannot see through. A 6-foot fence can work as well as an 8-foot fence if it’s slanted outward, toward the deer, at a 45° angle. Deer will be discouraged against jumping it because of the height and distance needed. Try installing two fences spaced few feet apart. Regardless of how tall they are, deer do not much care for being caught between both fences, so they’re less likely to attempt to jump. For extra protection, you can try this method with an electrified fence. Even a strand or two of electric fence can keep the deer out of your yard, as long as you remember to turn it on! Start with just one strand about 30 inches off the ground and continue to add as many strands as you need to keep the deer out. Remember, a fence is only effective if it surrounds your entire property! Make sure you’ve completely enclosed your yard or garden. You may be tempted to just block off the area where you’ve seen them coming inside in the past, but deer are tricky animals who will easily just find a new way in if they’re feeling very determined. Be sure that any gates are just as tall and secure as the fence you’ve built. As additional security measures, invest in a good deer repellant spray and add obstacles in the “landing zone” right inside the fence to further dissuade the deer from coming inside. When you follow these tips, you’ll be on your way to having a deer-free yard in no time! This entry was posted on Friday, August 14th, 2015 at 1:59 pm. Both comments and pings are currently closed.